Implementing processes to support the electronic management of assessment has been a priority for many universities and colleges in recent years, with many making use of Turnitin as a means of checking the originality of submitted work and providing feedback to students. The University of Sussex have been using Turnitin in this manner since the introduction of e-submission and e-feedback at the start of the 2014-15 academic year. The following article will look at ideas and best practice for using Turnitin’s GradeMark software (soon to be renamed Feedback Studio) to constructively align marks and feedback to a module’s intended learning outcomes. In essence, the purpose of constructive alignment is to ensure that all activities of teaching, learning and assessment within a curriculum are designed in a way that is relevant to the intended learning outcomes. Criterion-referenced assessment design is an approach commonly used to constructively align an assessment to learning outcomes. This method uses a scale of predefined standards to measure a student’s performance in relation to a set of criteria for which work is assessed against in order to determine a grade. Using criteria derived from the learning outcomes is an effective way to ensure that it is aligned. The benefits of this model are that it provides a robust set of benchmarks for tutors to ensure that marks and feedback can be justified in a way that is fair and consistent, and for students to use as a point of reference for how their work has been (or will be) assessed. 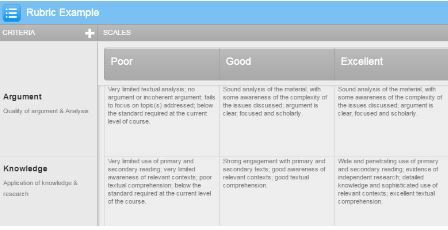 Rubrics are one of the key features of the Turnitin software for providing marks and feedback. They can be thought of as a grid-based form containing predefined feedback which can be customised (per assessment) to include criteria (on the vertical axis), scales (on the horizontal axis) and descriptors (on the grid). Tutors can use this tool to provide feedback on a student’s individual piece of work by selecting the relevant boxes on the grid which indicate the performance level on the scale in relation to each of the criteria. Criteria: defines the characteristic or property by which the work is being assessed. 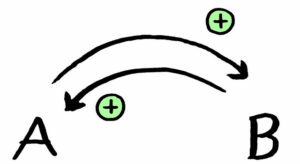 Typically derived from an intended learning outcome. Scale: defines the different levels of attainable standards. Typically based on a grade boundary or other performance indicator. Descriptor: defines descriptive details of the standards and expectations to achieve each level of the scale within the context of each criteria. A single rubric can be created and standardised per individual assessment in order to provide consistency for marking all submissions, however each custom Rubric form can be easily reused, adapted and shared for use in other assessments. Turnitin includes the option to automatically calculate a grade based on the percentage weightings of criteria and points for each level of the scale which can be defined during the creation of a Rubric. For technical guidance on how to create a Rubric or Grading Form, please see the Personalising TurnitinUK GradeMark information on the University of Sussex Technology Enhanced Learning website. Use learning outcomes for the module as a starting point for defining the assessment criteria and ensure that standards and descriptors are appropriate for the level of study for your students. For standards to have value as a justified measure, it’s important that each standard and related descriptor is written using language which is clear and concise for both staff and students to understand. Don’t overcomplicate it. If the rubric is too detailed, then student expectations and feedback will become too prescriptive and rigid; as a guide, 3 – 5 criteria and standards is a good number to aim for. Engaging students in the criteria before the assessment will provide a better understanding of the expectations. This could be facilitated through peer-review or formative assessment activities where students critically analyse examples of work using the assessment criteria. 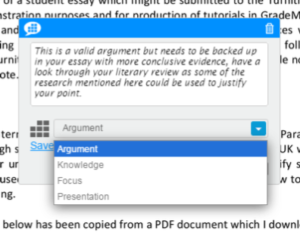 Another valuable but perhaps underused feature of Turnitin is the option to specify which assessment criteria (on the Rubric or Grading Form) each individual document annotation is relevant to. This adds a layer of personalisation and cohesion to feedback by enabling markers to align and contextualise individual qualitative feedback comments to the assessment criteria. It helps students to make the connections between how specific areas of their work has affected performance in relation to the assessment criteria, learning outcomes and overall grade. This is enabled by the ‘associate a criterion’ feature can be set by the marker within each individual QuickMark or Bubble Comment (see below) and can be set at the point of creating a comment or later on when editing them. This will display to the student (and markers) as feedback labelled by criteria within each individual comment where an association has been created, and also on the Rubric (or Grading Form) as a pop-out list (see below) of associated comments for each criteria. Selecting a comment from the pop-out list will highlight the comment on the paper to enable the student to easily review the comment from the Rubric within context of the document. For technical guidance on how to use the marking tools within Turnitin, please see the Marking with TurnitinUK GradeMark information on our website. 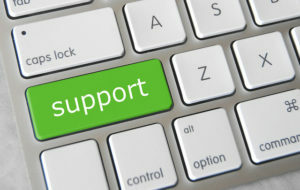 See our TEL e-submission pages for support or email tel@sussex.ac.uk. Providing support, training and guidance on effective pedagogic practice with the technology used for e-submission and e-feedback is one of the services provided by Technology Enhanced Learning for teaching staff at the University of Sussex. If you would like further support on any of the topics mentioned in this article then please contact your school learning technologist. We offer staff assistance in the design, development and implementation of Rubrics and Grading Forms within Turnitin and are able to set them up for your assessments so that they are available for use as soon as your assessment deadline passes and submissions become available for marking. Aligning teaching for constructive learning by Biggs, J. Designing criterion-referenced assessment by Burton, K.
4 Pings/Trackbacks for "Constructively aligning criterion feedback using Turnitin"